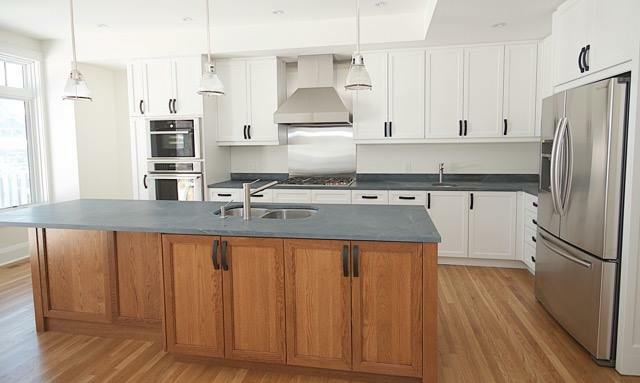 With over twenty years of experience, we’ve seen all kinds of kitchen renovation projects. We know firsthand the struggles and triumphs that come along with overhauling your kitchen. Creating a beautiful yet completely functional kitchen is no small feat. You need to think about planning the space efficiently—what is the main purpose of your kitchen? Are you a foodie or an entertainer? Do you have a big family or is it just two of you? These questions will help you determine how you can use your kitchen space to its potential. Add to that choosing lighting, picking out countertops, deciding on flooring and settling on sink, a kitchen renovation is a huge undertaking. But the reward of a brand new kitchen, you can’t put a price on that. We’ve rounded up five of our favourite renovations from past years to help inspire your renovation plans.